Half Full is one of Dr. Crygor's microgames in WarioWare: Twisted! 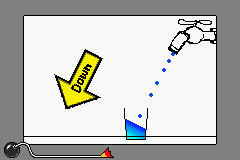 The purpose of the game is to move the cup under the water faucet and fill it with water until it is at least half full. 1st level difficulty: The faucet is on the right side. 2nd level difficulty: The faucet is on the right side, but there a block above the cup. 3rd level difficulty: The faucet is now a water fountain and it is on the left side. This page was last edited on September 19, 2018, at 21:50.